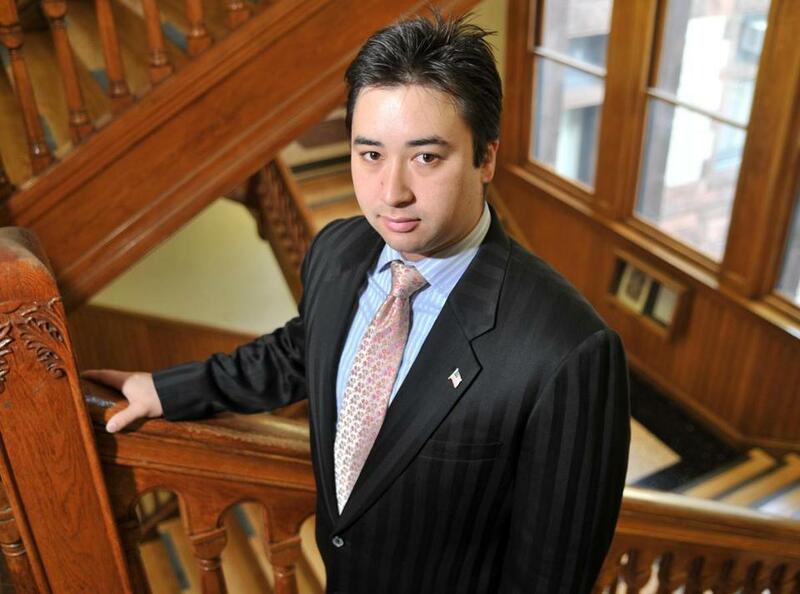 Leland Cheung, a member of the Cambridge city council. In a state abounding with politicians, the fact that only three lightly qualified Democratic candidates put themselves forward for lieutenant governor ought to raise serious questions about the office itself. None of the three men — Steve Kerrigan, Mike Lake, and Leland Cheung — boasts extensive experience, and none compensates with unusual charisma. Yet one of these men could plausibly become governor. Cheung, a three-term Cambridge city councilor, is the strongest candidate by dint of his determination to reject the past uses of the job as a political liaison with strong links to patronage. Instead, he plans to advocate for broadband access and high-tech jobs to underserved areas. But given the overall weakness of the field, the state also needs a serious discussion about how to reform an office that’s utterly useless — until the moments it becomes critically important. By law, the lieutenant governor has virtually no responsibilities except to step in if the governor dies or resigns. Indeed, the position has been vacant since former Lieutenant Governor Tim Murray resigned last year, with few noticeable effects. Every every role lieutenant governors take on is subject to the governor’s whim — making it unsurprising that recent governors have assigned their lieutenant governors tasks too lowly, or too politically tainted, to undertake themselves. Murray, for instance, served as Governor Patrick’s liaison to cities and towns, managing some of the unsavory patronage hiring that Patrick himself apparently preferred not to know about. If someone in the executive branch has to play those roles, it should probably be a staffer in the governor’s office, so that the governor can’t escape accountability for his or her actions. Still, given the way the lieutenant governorship has evolved, it’s fitting that two of this year’s Democratic candidates are longtime apprentices to prominent state politicians. Kerrigan, a former aide to Senator Edward M. Kennedy, and Lake, a protege of both former Boston Mayor Kevin White and ex-Governor Michael Dukakis, each seem eager to step into the super-staffer role that Murray vacated. Perhaps a little too eager; Kerrigan, who claims to understand why voters are frustrated with politics, also speaks uncritically about the practice of recommending political supporters for state jobs. He promises to advocate only for candidates in whom he has confidence, but does not explain how his years as a Kennedy staffer and the organizer of the 2012 Democratic National Convention make him qualified to assess resumes in specialized fields. Lake, a nonprofit executive, speaks knowledgeably about the transportation challenges facing Massachusetts, but struggles to explain how electing him to the lieutenant governorship would help solve them. Cheung, however, has an entirely different and more ambitious vision for the job, a keener understanding of why it’s fallen into disrepute, and a promising record in elected office. While he plans to maintain Murray’s municipal portfolio, Cheung says he will not get involved in political hiring. Instead, Cheung wants to serve as a liaison to the innovation economy. He boasts of being the only candidate in the race (or, likely, any other statewide race) who knows how to write computer code. Cheung’s competent record on the Cambridge council suggests he has a knack for using low-profile jobs effectively, having advocated for preserving office space for small startups and helping innovative companies like Bridj take root in the city. Cheung also shows some reform inclinations: He favors abolishing the archaic Governor’s Council and changing the state constitution to make lieutenant governor a more meaningful office. Indeed, a thorough reassessment of the job is overdue. It doesn’t have enough everyday authority to draw top-tier candidates, yet, when lightning strikes, it has too much power to entrust to the kind of candidates who seek it. One option would be to join states like Oregon and New Hampshire that dispense with lieutenant governors altogether, and designate another constitutional official like the secretary of state as the replacement for a gubernatorial vacancy. Another would be to end the practice of candidates running as a single ticket in the general election, making it theoretically possible for the governor and lieutenant governor to come from different parties. This would force lieutenant governor candidates in the general election to make an affirmative case for themselves instead of riding the gubernatorial candidate’s coattails; stronger candidates might emerge if they felt they could stand on their own merits and not risk being dragged down by a lackluster gubernatorial nominee. Another would be to give the lieutenant governorship formal responsibilities, so that it attracts a higher caliber of candidates. The next person to hold the job — whether one of the three Democrats or Republican Karyn E. Polito, who is running unopposed in the GOP primary — should lead a discussion of those options. Indeed, if Cheung is elected, an ideal outcome would be for him to transform the lieutenant governorship into an important enough position that no candidate with his level of inexperience ever wins it again.